Cruisers: We are now publishing Downloadable Track Files in both MaxSea (.ptf) format and in OpenCPN (.gpx) format (not all tracks are available in all formats yet - we're still working on it and they take time). You can download the track files either by clicking on the links in the tables below, or by clicking on the track in the Google Map below the table. The MaxSea files are in native format but the OpenCPN files are zipped so they download faster, and they need unzipping after they've been downloaded (which most operating systems do natively). If 2 files are shown, the smaller one has been edited to remove redundant points from straight tracks. This improves the speed of the download as well as performance once the file is loaded. Sometimes MaxSea Track files are separated from the Mark (chart notations) files. Download instructions are provided if you need them. These files are provided free and we are actively soliciting cruisers to send us your track files so we can post them for others to download. If you would like to to participate, please email us your track files (as attachments to our HackingFamily account, not our Winlink acct) along with your boat name and draft. If you include your website and boat details, we'll link back to you from our Cruising Links page. Disclaimer: While we always try to provide useful information, we can take no responsibility for its accuracy or usefulness. Prudent mariners will always navigate using all means at their disposal, and will not rely solely on electronic navigation. Note that Taniwani's Galapagos tracks were originally made using GPS offsets to make the positions match the charts. As of 2011, the CM93v2 charts were still incorrectly placed for the Galapagos. We believe that we have successfully removed those offsets and that these track files are now corrected for WGS84. 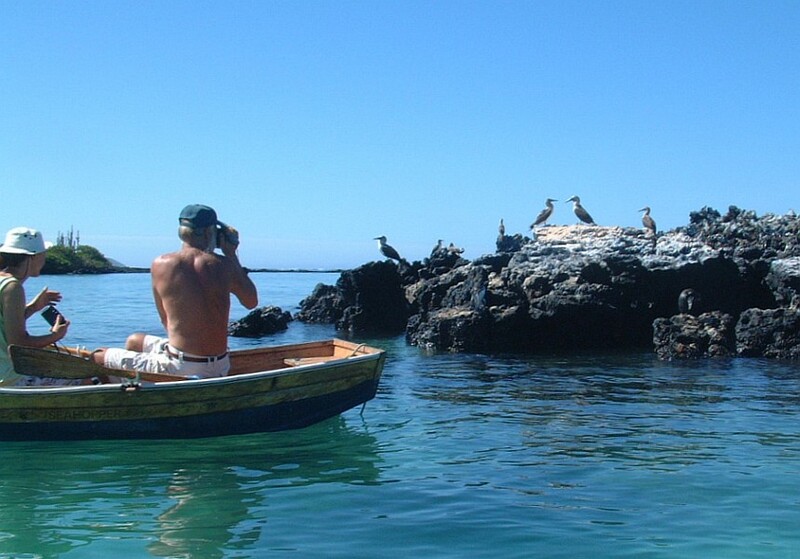 However, like all electronic aids to navigation, we recommend that you not depend solely on these tracks for your navigation through the Galapagos Archipelago. 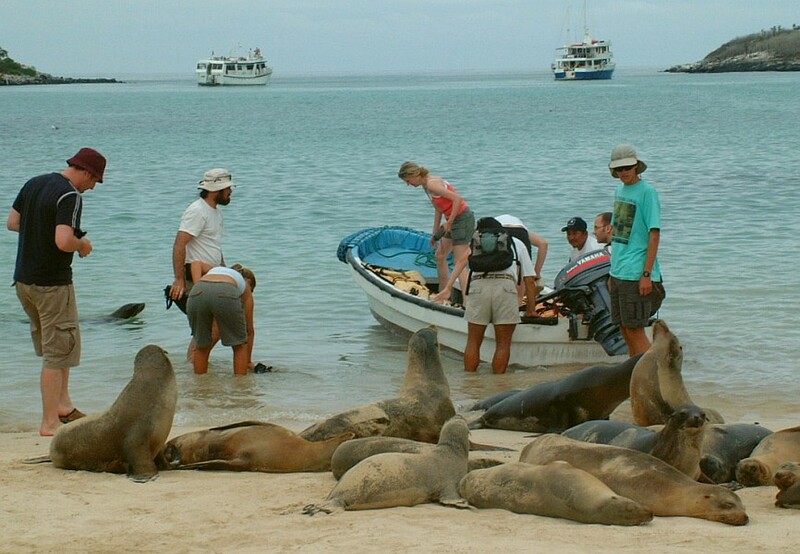 Welcome to the Galapagos. 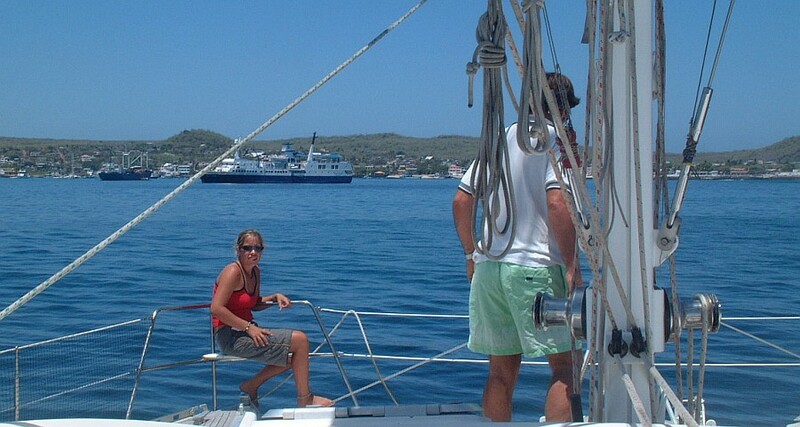 As of 2003 we did not have to stay in just one anchorage, despite what the port captains said. We checked in with them all, and they all said we weren't supposed to go anywhere else, but they were all glad to see us. In San Cristóbal (where we made landfall) we talked to the head of tourism (at the head of the dock) and he set us straight. Although the port captain made a date with us to come out to the boat the day after we arrived, we never saw him again (a good thing, as he's reputed to confiscate alcohol). The anchorage here is OK but be careful of the central reef to the west. Landing a dinghy on the concrete steps can be tricky with swells and tidal change, but we always managed it. Leaving a dinghy on the beach invites not only kids but sea lions into it. We found we had to tie ropes across the top of Ocelot's sugar scoop steps to discourage the sea lions from climbing all the way into our cockpit! Just ashore, to the east of the anchorage is a trail leading to the new interpretive center, which is free. We took a local taxi (bargaining on the price) out to the tortoise center and to the highlands -- a trip well worth the $30 for the day. Guide books are available for sale in the tourist shops at the head of the dock. Jon had to have a root-canal here but only 1 of the 3 dentists we talked to had an autoclave (and he still answered the phone with the same gloved hands that he stuck into Jon's mouth). Another somewhat low-tech dentist in Puerto Ayora put an initial crown on using UV-activated plastic. The anchorage at Puerto Ayora, Santa Cruz Is. The Puerto Ayora anchorage was OK but there can be some big swells coming up from the south, and it's totally exposed to the south. This anchorage is crowded with tour boats which come and go at all hours of the day and night. It's safest to anchor away from the cliffs and tour boats. The dinghy channel off the town has sufficient water at all tides, but becomes very narrow at low tide. There is an excellent walk to Tortuga beach which opens at 6 or 7 every morning. There is also a nice trail to a swimming hole (Las Grietas) which can be tricky to find. The trail starts just to the west of the anchorage - there are some public landings next to the restaurants. 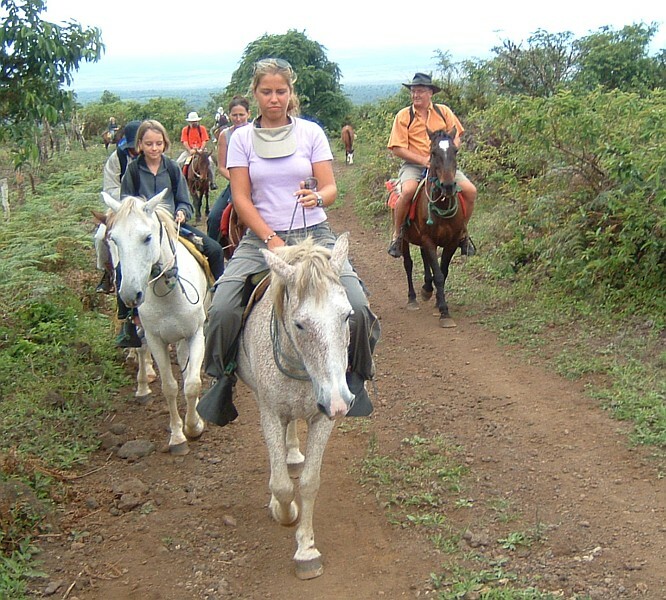 Follow the trail but you need to get off the main trail near the end and follow a smaller trail between the wall and the salt pond. It doesn't look like much when you first turn off the main trail, but then it gets much clearer. Be sure to bring snorkeling gear as the water is deep (40' or 12m) and clear and almost fresh. There's also a short subterranean passage between some pools. In town, the dinners (ask for the Merienda) were only $2-5 at the little places on the street 3 blocks back from the water. We highly recommend having a friend look after your boat while you take a tour. Go ashore and talk to the many booking agencies and ask if they have any last-minute deals. The incremental cost of them adding another few guests is almost nothing, so whatever you pay will be almost pure profit to them, so you can find some great deals. This is by far the cheapest way to visit the "not-allowed" islands. The tours should include all meals and an English-speaking naturalist. 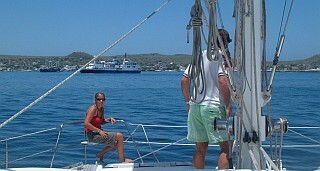 Our boat held 18 and only had 4 people booked, so they were very glad to see the 5 of us, and we had a fabulous time. Isabela is by far the most protected anchorage (and probably our favorite) as, at high tide, you can go way up front to a very protected hole. Even the normal anchorage (which is as far as we went) is well protected by islands. The buoys have changed recently with new red and green ones (US system, Red on the Right as you're Returning). Once in the bay (watch your GPS to avoid the shoals!) favor the left (beach) buoy, then head for the yellow buoy just behind the anchorage. There is also an excellent loop walk near the anchorage, but it's difficult to find unless someone shows you. Dinghy in front of the boats, turn right (around the penguins) and go about 200m, then look for stone steps coming down some distance away on your right. If you go at low tide, swing wide to avoid the rocks. Use a stern anchor and tie to the rocks. The shark pool was amazing (with its silly No Swimming sign). 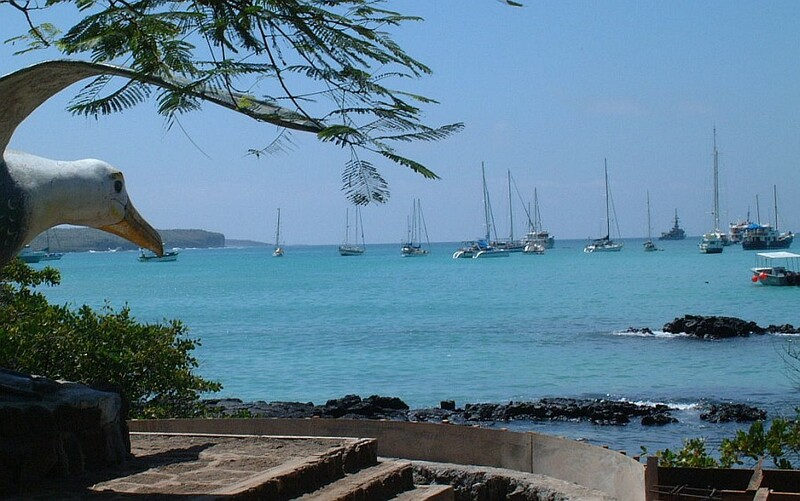 In 2003, most cruisers checked out from Puerto Ayora, as there's not a lot of officialdom in Isabela. We'd touch bases with the port captain, but he didn't care how long we stayed, or how long we'd already been in the Galapagos. There is a fuel station (same cheap price as the rest of Ecuador!) so tanks can be topped up. There are a few tiny shops and a bakery, but not much. Sue found Modesto, who owns horses, and talked him into $20 (guide) + $35 (truck) + $7/person for the horses - quite a savings over the $20/person Joseph charges, but Joseph does speak English. The horse ride is VERY worthwhile - a must do if you possibly can - as it goes up to and along the rim of the caldera. Very amazing. Be sure to go to ALL of the Darwin centers (there seems to be one, or its equivalent, on each island). They have worthwhile walks leading out from them as well.